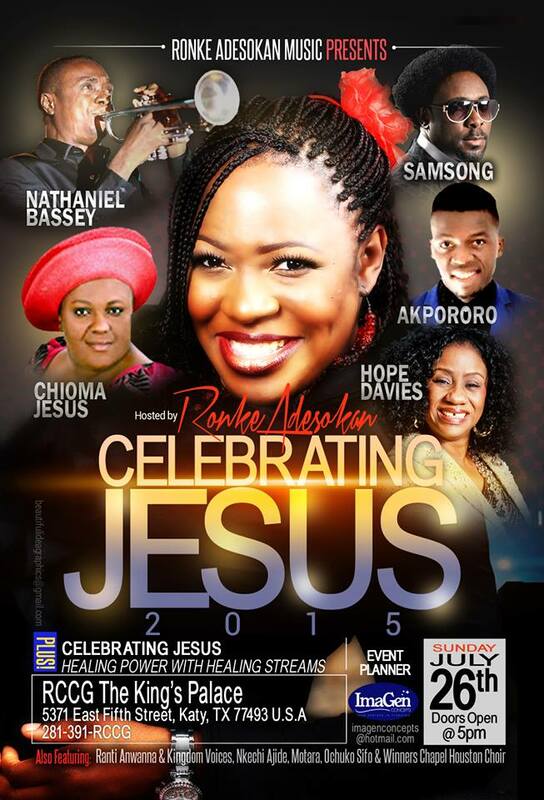 Minister Ronke Adesokan will be ministering with other anointed music ministers at this year’s Celebrating Jesus coming up in Houston this weekend, 26th of July 2015, you don’t want to miss it!! She began singing professionally at the age of 7 and maintained her passion for music as she grew into the full understanding of the Call of God on her life in the music ministry. She travels across continents ministering in songs to people. Through the grace of God upon her life, she has recorded six (6) albums Be Still, Bigger, Grace, Manifestation,Celebrating Jesus and Celebrating Jesus too. Celebrating Jesus concert is one of the worship concerts she holds where Gods people gather to worship. She has had the privilege of ministering on stage with the likes of Cece Winans, Ron Kenoly, Martha Munizzi, Cindy Cruse-Ratcliffe, Phil Driscoll, Jaci Velasquez, Don Moen, Alvin Slaughter, Lionel Peterson,Vickie Yohe, William McDowell to name a few. She has also ministered before many dignitaries and high ranking officials. She operates in a unique anointing and believes that humility and holiness is the key to a life of walking in Grace.